Product #60502 | SKU MVKN8TWING | 0.0 (no ratings yet) Thanks for your rating! Heavy-duty and rigid, it features a two-stage design and is ideal for a variety of shooting assignments. The Manfrotto Nitrotech N8 Video Head & 546GB Pro Tripod with Ground-Level Spreader is a revolutionary head that combines all of the most successful features of the Manfrotto Video Heads range with a breakthrough technology for continuous counterbalance - The Manfrotto NITROTECH. The N8 features a unique nitrogen mechanism - the state of the art technology for continuous counterbalance system on professional video heads to allow the operator to effortlessly and safely hold and use different video camera sizes. It has a great payload capacity of up to 8kg! And features the best fluidity for pan and tilt movement together in a cutting edge piece of design. The Nitrotech N8 boasts a new distinctive design that emphasises the core breakthrough technology. 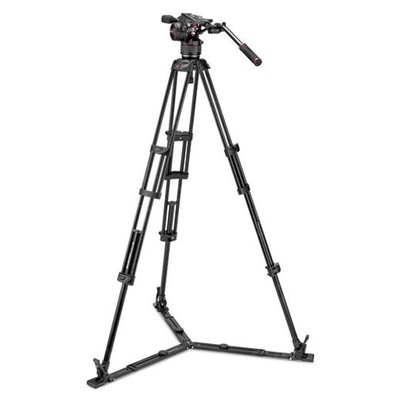 The Pro Video Tripod Versatile is robust and precise, and is a top quality choice for professional photographers. Heavy-duty and rigid, it features a two-stage design and is ideal for a variety of shooting assignments. For creating professional films and videos, this must-have video tripod gets the job done with ease. Featuring a die-cast aluminium crown with a 75mm bowl, it can be used with a variety of equipment. Able to safely support an impressive payload of up to 20kg, it is an unparalleled choice for almost any job. Featuring a telescopic ground-level spreader, you'll be able to easily level you shots no matter the terrain. The spreader also ensures that your video tripod won't topple over in windy conditions. Set the leg angles accurately with the leg locks that hold their positioning and won't budge while in use. With a minimum height of 32.5cm and a maximum height of 158.8cm, you'll be able to get that perfect shot. Featuring rubber feet which can be removed to reveal metal spikes, this tripod is suitable for any environment. Use the rubber feet for smooth floors, and the spike feet for rugged terrain and rest assured knowing that you gear is safe. With a combination of reliable features, this tripod is an all-in-one solution. Designed in Italy with the highest standards of quality, it will consistently get the job done throughout its long lifespan.